All outsourcing isn’t created equal. It’s important to know what you're getting in real terms. All outsourcing isn’t created equal. It’s important to know what you're getting in real terms. Even the most outdated methodologies can sound enticing with the right spin. Here, we’ve taken the industry speak and laid it bare, showing you what it really means and why it’s important to you.  There are many differences between the modern BPaaS method of service delivery and traditional BPO. However, you can focus on five crucial areas to see the most differentiation, and ultimately, benefit, from BPaaS. Incorporating business process events into an existing platform presents complex challenges unique to each step of every process across their respective lifespans. From initial implementation to routine management, integrated solutions need workarounds to function properly. Applying a one-size-fits-most approach is heavy-handed, complicated and extremely expensive. BPO services exist outside your organization’s processes with multiple failure points. No single point of contact for FAQs or to error correction. Business process events are delivered, scheduled and processed inside your existing Workday environment without the requirement of external resources or third-party dependencies. Deployments are sleek and cost-effective. We operate inside of Workday to deliver your services, allowing us to act as an extension of your team. One application, one service provider and one point of contact. Help is always within reach. Rigid infrastructure is incapable of accommodating routine business behaviors and growth periods. Inherently fixed and restricts growth. Adaptive infrastructure is designed to resize with an organization, supporting business requirements before, during and after stages of change. Inherently flexible and inspires growth. Specialized client services are designed to do certain things a certain way at certain times. Predefined services require retrofitting to perform the functions you need, in your way and on your time. BPO services are intentionally restrictive. Requires major coding and integration modifications that cost time and money. Standardized client services combine the reliability of a pre-built service with the functional value of a built-to-order service. OneSource services solutions are intentionally consistent. Like wizard-based software, choose what to turn on and get ready to reap the benefits. Lift and shift manual processes are constantly exposed to human error. BPO services are only as dependable as the users who operate them. Increased risk and resources concentrated on fixing problems. Automated processes eliminate instances of human error. OneSource Virtual services ensure quality, drive compliance and free up valuable resources. Reduced risk and teams focused on strategic projects that move your business onward and upward. Off-premise management of business activities can result in reduced information control, loss of vital data and the inability to evaluate trends as they occur. BPO services create an illusion of agility by forcing you to give up control of your data. Out of sight, out of mind. Delivery of automated business processes through cloud-hosted networks allows you to maintain immediate access and complete control of your data. OneSource Virtual provides actual agility through real-time access to your data. Seeing is believing. From automated payroll fulfillment services to a fully managed payroll solution for Workday, OneSource Virtual provides a full suite of U.S. and Canadian payroll services available within your Workday application. OneSource Virtual delivers U.S. and Canadian employer payroll tax processing, filing and reporting services inside your Workday application through a seasoned team of certified payroll professionals. Whether you need payment and disbursement transactions processed or comprehensive administrative assistance, OneSource Virtual’s garnishment solutions work within your Workday application and require no third-party integration. OneSource Virtual’s U.S. and Canadian Benefits Administration streamlines enrollment, manage costs, eliminates redundant processes and improves overall employee experience.  Improve the procure to pay process with automated solutions from OneSource Virtual. FAO services delivered inside your Workday application Increase efficiency, eliminate errors, gain real-time visibility and control and improve cash flow. Your payroll and benefits solution need to change in pace with your business growth. OneSource Virtual’s tiered levels of product support ensure that your Workday platform stays aligned with your HRIT objectives. The bundling of As-a-Service options, including PaaS, IaaS, ITaaS and SaaS to support the automated delivery of Business Process Outsourcing (BPO) solutions through cloud-hosted networks to serve a group of users. A service that is accessed, managed and supported within your existing service application. The complex and costly wholesale outsourcing of existing business processes to a third party interest. The act of incorporating an external entity into your existing business platform to provide outside services, processes and support. If you need more information about BPaaS, please fill out our form and a OneSource Virtual representative will be in touch very soon.